No fewer than 218 head teachers and school principals nationwide are to benefit from the Federal Government’s Academic Leadership Workshop. The Director-General, National Teachers’ Institute, Kaduna, Prof. Garba Azare, disclosed this at the maiden edition of the Academic Leadership Workshop organised for head teachers and school principals in Abuja last Tuesday. Azare said the leadership workshop was part of the nationwide capacity building workshop for Nigerian teachers under the 2017 Sustainable Development Goals (SDGs) project. He said this phase of the workshop would cover new areas of digitalý literary and academic leadership. “These two additional components are deemed to be very crucial in the quest to revolutionise the education sector in the country. “While ICT is generally regarded as a tool for a complete overhaul of teaching and learning transactions in the school set-up, it cannot be relied on to achieve the much needed transformation without functional leadership to drive it. “Schools can be lucky to have all the requirements for effective two-way transaction but may under perform if the right calibre of leaders are not appointed for them. He said the training was aimed at equipping head teachers and school administrators with effective classroom process techniques. He said it was designed to develop their management skills on how to promote school and community relationship to achieve improved students’ performance. Azare said the government was determined to equip them with management process. According to him, the government is determined to acquaint them with roles and responsibilities of school managers and administrators with emphasis on team building, effective communication, mentoring, coaching and counselling. In her remarks, Senior Special Assistant to the President on SDGs, Mrs Adejoke Orelope-Adefulire, said her office had recognised the crucial role of head teachers in the attainment of SDG4. According to her, capacity building workshops for teachers have been designed to enhance the capability of public sector basic and senior secondary school teachers for more effective performance. “It is also to ensure inclusive and equitable quality education nationwide where no one will be left behind; the main objectives of the SDGs is that no one should be left behind. Orelope-Adefulire, represented by Dr Ify Okegbu, said there was a need to build synergies to ensure that head teachers were recruited, empowered, properly trained and retrained. She urged the participants to work hard and achieve the objectives of the training and ensure that they shared whatever they learnt with their colleagues. In his remarks, Mr Ani Bassey-Eyo, Director, Axiom Learning Solutions, the technical consultants for the workshop, said the programme was aimed at building a crop of academic leaders. 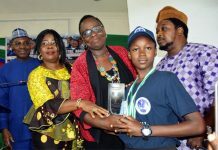 Bassey-Eyo urged the participants to impart the learning outcomes in their students. “It is not just about getting a certificate but ensuring every child leaves school with something be it a sport, music or academics. “Everyone of you must start to put simple plans to build that teacher, that corps member in your community so they also can be future mentors,” he said. ýThe News Agency of Nigeria (NAN) reports that three-day workshop holding from July 17 to July 19, will be held simultaneously in six state capitals in the six geo-political zones. 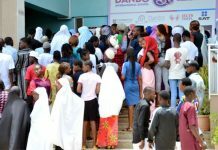 The 218 participants were selected as follows: three head teachers and three Junior Secondary School principals or vice-principals per state and two participants from the FCT.